Fog machines operate by moving fog juice into a temperature controlled heat exchanger that vaporizes the fluid and produces the fog. Since heat rises, the fog that is produced usually ends up hanging anywhere from the top of the fog machine to the top of the ceiling. I’m convinced that anyone who’s ever purchased a fog machine had dreams of an entirely different effect with the fog hanging low to the ground creating that creepy looking mist that Hollywood has spoiled us with. 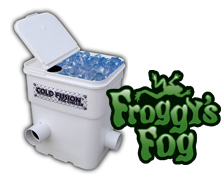 The solution of course (short of utilizing dry ice) is to chill the fog before it is emitted, and Froggy’s Fog has just the solution with their Cold Fusion Vortex Fog Chiller. 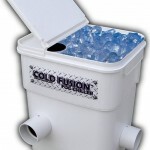 This beauty stands just 19″ off the ground and is capable of holding up to 20 pounds of ice. You WILL need to provide your own fog machine for this to work, then just set it so that the fog emitted enters the opening on the Cold Fusion unit. The fog will be cooled as it passes through the Cold Fusion unit until it is emitted as chilled fog! Simple and effective.